Please can you give a brief overview of the molecular targeting program of the cardiology research laboratories at the University of Texas Health Science Center at Houston? For about the last 25 years, the cardiology group here have been developing a platform technology for both the diagnosis and treatment of atherosclerosis. From around 1991, I was an Assistant Professor in the College of Pharmacy at the University of Illinois, Chicago, and one of my colleagues was a liposome expert who had been brought into the collaboration by Dr. McPherson. Since I'm a biochemist, she involved me to work on the targeting aspect of the technology. It is intrinsically echogenic liposomes, which are very simple cell-like structures. The process we developed enables them to trap air and other gases by virtue of a production methodology. They reflect ultrasound and are an ultrasound contrast agent. Liposomes have the great advantage of being able to be targeted by conjugating various macromolecules such as antibodies or smaller targeting molecules such as peptides to the outer surface. We use fairly straightforward chemical techniques to couple ligands to the liposomes. We've looked at a number of things and have now evolved from this into therapeutics. One of the first therapeutics we encapsulated in the liposomes was tissue plasminogen activator (tPA), which is used to dissolve clots in cases of myocardial infarction and ischemic stroke. Right now, our lead application is for stroke, using this formulation as well as a gas-encapsulated liposome. Bioactive gases is another area we've moved into. We've encapsulated nitric oxide, which has many important beneficial vascular effects, and now xenon, which is a neuroprotective gas that is very promising. We're moving forward with the clinical development of this and it can be used for both ischemic and hemorrhagic stroke. During this process, I've applied a number of more advanced evaluation techniques for these targeted liposomes, including thermodynamic analysis, which is not used very much by academic scientists, but more by industrial scientists. It's becoming more and more popular. Could you please outline your research on the acoustic characterization of echogenic liposomes (ELIPs)? What was the objective of the study? There are two types of ultrasound that are used clinically. One is conventional ultrasound, for which there are a number of different terms, depending on what you're looking at and how you're looking at it. However, the common denominator is that in conventional ultrasound, the probe is always held outside of the body. It's non-invasive and you have a focal distance, with the probes and settings being manipulated in order to look at structures of interest. The other type of ultrasound is intravascular ultrasound, where a catheter is inserted into a vessel such as the femoral artery in the leg, as happens with angiography, and then you can thread the catheter almost anywhere – into the aortic arch, the heart, the carotid artery, and so on, under the guidance of fluoroscopy. In the catheter, there is an ultrasound probe that rotates, providing a 360 degree view of the inside of the vessel. This is very popular for assessing atherosclerotic plaque. Now, what we do with this is simply insert one of these catheters and probes into a glass vial that contains a suspension of liposomes at different dilutions, which provides reflectivity. White specks, which are the reflection points from the liposomes, can then be recorded on video tape. We grab frames from that and perform image analysis using standard programs such as Image-Pro Plus. We then quantitate the gray-scale, which goes up from 0 to 256 , providing a measure of whiteness. For instance, an index that we use for the echogenicity is the mean gray-scale value at a concentration of 50 micrograms of lipid per milliliter; we call this the E-50. For unconjugated liposomes, we typically get E-50s of around 200 out of 256. We are now at the point where it's almost as good after conjugation, definitely over 100. Between 100 and 200 is acceptable and the idea is that once these liposomes target and bind to vascular structures, they accumulate and reflect the ultrasound pretty strongly. One important point about being echogenic is that you get cavitation effects when you subject these things to ultrasound. It is a controlled release formulation. We can load the liposomes with drugs, genes, and even stem cells and then apply ultrasound from outside the body to these once they've targeted and bound and you can release the payload. It's very useful. In what aspects of your work do you use the Multisizer Coulter Counter? The Coulter Counter is very important and is used for characterization. We do not extrude these liposomes; we do not make them a single size. At least 99% of liposomes are very small and an average of about 100 nanometers in size, but once you target these and conjugate them, you end up with a total of about 1013 liposomes per milliliter. As 99.9% of these are around 100 nanometers, that leaves somewhere around 109 per milliliter that are larger, with the average being anywhere from about 600-800 nanometers in equivalent spherical diameter. This is the most useful population of liposomes. They're the most echogenic and will have most of the useful payload of anything you load them with. Even though the vast majority are very small, there are still plenty that are large enough and they range in size to no higher than two microns. This means they still will traverse the pulmonary vasculature. You can inject them intravenously and they'll end up getting into the arteries. We perform dynamic light scattering (DLS) for liposomes smaller than 400 nanometers in diameter, but the big limitation of DLS or any of these nanoscale instruments is that you cannot determine the number of particles. 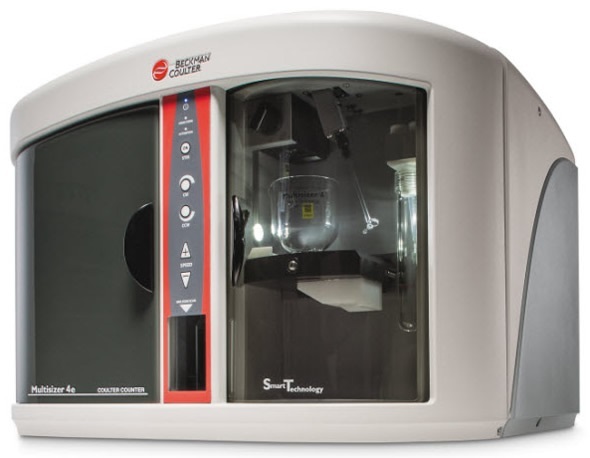 We use a Zetasizer to get the lower range and the Multisizer for everything over 400 nanometers. We also use a 20 micron aperture so that our low end is 400 nanometers. From that, we can extrapolate and actually determine the number of small particles as well. There's really no other way to do it. Using the Multisizer, we can get the whole range enumerated and also get the size distribution throughout the entire range. Another advantage of this is that we are able to get ultrasound reflectivity or acoustic reflectivity measurements across the range of all the different ultrasound instruments and get some very precise and useful information about targeting parameters that most people are not getting. We have two measures of protein conjugation efficiency that we focus on. We've developed a quantitative immunoblot technique for measuring the amount of immunoglobulin on the surface of the liposomes. From that, we simply get micrograms of IgG per milligram of lipid. The other is using the Multisizer to enumerate the liposomes and get the number of IgG molecules per liposome, which we can do very accurately for both the larger and the smaller populations. We've improved accuracy by using both sizing methods. Using the number of IgG molecules or antibody molecules per liposome obtained from Multisizer analysis, we can obtain several different targeting parameters. For instance, using an ELISA, we can calculate the actual number of antibody molecules that are binding to the antigen, to the target, and we can also use the ELISA to get affinities. From the affinity of binding, you can get an avidity. There's an avidity which is actually just an index because it's not based on real-world binding. If you take the total number of antibodies per liposome and multiply it by the affinity, you get an avidity, but it does not reflect what's actually binding. However, using all these methods together, we can find out the number of antibody molecules that bind to the targets and get an effective or specific avidity from that, which gives you the total force of binding for each liposome, in terms of what's actually binding to the target. That is probably the most accurate measure of affinity or effective targeting efficiency of liposomes and we have published work on this. We have correlated the total avidity with effectiveness of binding in a flow chamber under physiologic conditions. Therefore, we can get a pretty good idea of the effective targeting or binding efficiency of these liposomes. This is important because one thing that has been largely ignored or overlooked in all of these targeting studies is the feasibility of binding under clinical conditions. A lot of these formulations start off seeming promising, but then never make it to the clinic because the targeting doesn't hold up. What's usually done is fluorescent staining in immunohistochemistry, for instance, to show binding of a targeted formulation to the tissue in question and this is usually considered sufficient. Flow cytometry has also been used, which is better, and then there are animal experiments which have shown that a targeted formulation is better than an untargeted formulation. However, these things tend not to hold up because we have found, for instance, that you need an affinity of over 5 x 107 M-1, which corresponds to a dissociation constant of 20 nanomolar, to get a useful target for clinical use. We calculated that the 5 x 107 M-1 is the affinity for nonspecific binding due to ionic interactions, which you would get with immunoglobulins. It's important to realize that these are under flow conditions. A lot of people are using peptides to target, which tend to be a low affinity. You can overcome this if you conjugate enough of them to your nanoparticle, but you have to be sure the avidity is high enough. We have shown that you have to get a specific avidity of over 1010 M-1 per particle in order to have an effective clinical use under vascular flow conditions. Now, if you're targeting a tumor and you're depending upon the flow dynamics, the ESL and so on to do this, that might be different, because if you get into a slow flow situation, you might be able to get away with lower affinities. If you're doing anything with a vascular application, however, where you're just injecting it intravenously, there's some very stringent conditions there that make it difficult to get an effective targeting modality. Could you please give an overview of your more recent research on thermodynamic analysis of antibody-antigen association interactions and how this was used to test the hypothesis that antibody-conjugated ELIP (Ab-ELIP) affinities for their respective antigens can be predicted? This is a very interesting point, because we discovered a very unusual effect. When you're working with liposomes, you're conjugating ligands such as antibodies directly to the head group of phosphatidylethanolamine, which is interpolated into the lipid bilayer. Apparently, there are energetics involved where the energy of the phase transition of the gel to liquid crystal form of the acyl chains is transmitted to the binding and vice versa. It's a two-way issue, but basically we found that in a consistent and predictable way, the energetics of the phase transition is added or subtracted from the energetics of the binding of the antibody to its target, but the proportion of the maximum transition energy transferred varied. It's not necessarily the entire energy, like the enthalpy of the binding that's transmitted, but there's a fraction of it, and we were able to work out an algorithm where you could determine and predict the additive effect of that phase transition. Therefore, we could actually predict the affinity of the antibody binding once it's conjugated to the phosphatidylethanolamine and that is specific. Once you incorporate the phospholipid into a liposome, it doesn't make a difference. It's the same as just that one conjugation. We then tested it for a number of different ligands and a number of different conjugations and we had quite an accumulation of data. We published a paper on that and it turns out that there’s not much benefit in predicting the strength of the binding parameters as opposed to just knowing the affinity of binding and the thermodynamic parameters of the unconjugated antibody. Normally, the binding affinity does not change by more than an order of magnitude. In a way, it's good news because it means that if you know the affinity of your antibody up front, then you can pretty much predict how effective it's going to be. The whole point was you could predict it based on the unconjugated antibody, but you don't need to predict it because you can evaluate the antibody just by looking at its affinity. For instance, if you have an antibody that has a ten nanomolar binding KD (dissociation constant), you immediately know it’s going to be a suitable antibody for conjugation. However, it is still important to do a thermodynamic analysis and the idea of determining the affinity of your conjugated antibody and thermodynamic analysis of the conjugated antibody are still useful parameters. We have seen cases where you lose a lot of the affinity once you conjugate. It's an exception, but you still should check. It can happen; all kinds of things can happen to an antibody. How did you determine Ab-ELIP size distribution and number? We use the Multisizer. The liposomes are in suspension. We sampled them with the aperture tube and we get a standard report. Our collaborators, a group of ultrasound engineers at the University of Cincinnati, have actually used the features of the Multisizer more than we have. They'll go to individual bins, looking at the distribution there. They look at volume distributions as well as number distributions, which has been useful to them. Dr. Christy Holland has a Multisizer 4 over there. She actually got hers before we did and they've used it routinely. There's a paper published by Kopechek et al., where they've done the size analysis more thoroughly. Why did you use Beckman Coulter’s Multisizer 3 and 4 and what were the main advantages of the Multisizer 4 over Multisizer 3? I started using the Multisizer when I was at the University of Illinois in the late ‘80s. The fellow I was working for over there, Dr. Michael Groves, was involved with the early Coulter instruments when he was working in Leeds, England. They were using basic manometers. I got a used one for free when I was at the University of Maryland. I think it was a Multisizer II we were using to analyze BCG, which we published work on. Over at UIC, I was at the Institute for Tuberculosis Research and they used to make the Tice strain of BCG vaccine, which was divested to Bionetics. We had huge stocks of various BCG lots and we were doing cancer research with it, because it is still used for superficial bladder cancer. We used a Multisizer for that, which involves extremely complex size distributions. That's where I got acquainted with it and then there was a Multisizer 3 here on campus at the Texas Heart Institute, which we were using when we got here. Of course, the Multisizer 4 is an enormous improvement. The refinement and automation of this instrument is amazing, very logical, very well done and incredibly simple when I think of what we used to have to go through. At one point, we were using a 15-micron aperture tube, which would clog, meaning we had to use a brush with the magnifying lens to look at the aperture to unclog. The 3 was really a lot more hands-on. Now, it does all this stuff automatically; it loads the protocols, methods and so on. I think it's a very good approach from very good engineers. What are other drug delivery applications for the Ab-ELIPS? There's another very important aspect I didn't mention, which is that we also discovered a very interesting situation when you load these liposomes with proteins that have a targeting aspect to them. For instance, tPA has two binding sites for fibrin and we've explored the idea of using tPA as a targeting ligand by conjugating it to the liposomes. However, when you load liposomes with tPA, the binding sites are exposed and we've also found this for antibodies. For instance, when we loaded bevacizumab, which is a commercial antibody specific for VEGF, as a therapeutic, we found that the binding sites were exposed on the surface of the liposome. This means that you do not need to specifically target these formulations. Bevacizumab-loaded ELIP will target to VEGF automatically and once it binds to the VEGF, for instance in the adventitia (the outer wall of arteries), you can then apply ultrasound and release a payload of bevacizumab that's inside the liposome. This is an interesting aspect and we've been working with bioactive gas-loaded liposomes, which are very easy, in terms of releasing that payload with ultrasound. In the stroke application, we're able to just take xenon-loaded liposomes, infuse them intravenously, and then insonify with an ultrasound probe over the carotid artery, which releases the xenon in the local cerebral circulation. That will go right into the brain and protect the brain cells in the penumbra. This is similar to what happens when oxygen is cut off from sections of the brain. A certain number of cells are necrotic and can't be saved, but surrounding them is a zone of cells that are in a deficient state of oxygen. Those are still alive and will die eventually if nothing is done. We have found, as have others, that the noble gas xenon will protect those cells from dying if you can get oxygen back to them within a reasonable period of time. The time window we found is within six hours. This technology is a very promising and powerful technology. What we have is a targeted controlled-release formulation that can be triggered by ultrasound outside of the body. Where do you see the field of liposome research and drug delivery heading and what are the new frontiers on the horizon in nanomedicine? This is very interesting because there are so many different avenues. Despite the huge amount of research that has been done into targeted nanoparticulates, there has not really been any clinical product yet. I think that goes back to the issue that achieving useful targeting clinically is very difficult. If you look at what has succeeded, it is molecules. For instance, antibody drug conjugates are very big now and are on the verge of being licensed for cancer application. An example is the Trastuzumab chemotherapeutic drug conjugates that Genentech has been doing, but not nanoparticulates. A continuing problem with nanoparticles is safety, because most nanoparticle formulations have not yet been completely characterized for clinical safety issues. One of the great things about liposomes is that there are already licensed drug-loaded liposomes out there such as Doxil, which is doxorubicin-loaded, and there are many versions of Doxil internationally. The Chinese have one, but there's been a problem with the manufacturer here. These things can happen, but it's been very successful. Then there's the amphotericin-loaded liposome, which is widely used for fungal infections in patients with AIDS and that has been very successful. You also have the ultrasound contrast agents, which are, to one degree or another, liposomal such as the various aerosomes and so on, so from an FDA standpoint, you're at an advantage with liposomal formulations. We're hoping that ours will be one of the first to be approved in some way for the targeted liposomal approach. It should be pointed out that there is also passive targeting, which is what you do when you subject gas-filled liposomes to ultrasound from outside of the body in a certain location. There, you can use nontargeted liposomes and still get a targeting effect. People are doing this with magnetic formulations such as iron-loaded nanoparticles. So, as far as the future is concerned, I believe there will be clinical breakthrough fairly soon. There's a lot of effort being put into microbubble approaches to ultrasound applications and there seems to be a competitive spirit between researchers working on liposomes for ultrasound applications and microbubbles. I continue to have questions about the idea of targeted microbubbles, because you have to use biotin-avidin linkages for that. There are biotin-avidin formulations in clinical trials. I don't know if any have been approved yet, but there are still allergy concerns about those because the formulations include streptavidin, which can be allergenic. It would be very helpful if they could work, but the problem is that whenever you put proteins, especially antibodies, next to a gas interface, you're going to have problems with denaturation. I also don’t think there’s much capacity there in terms of loading microbubbles with therapeutics. There are advantages that the microbubble people would argue; in terms of ultrasound reflectivity, they're terrific, but when you get into targeting, they can be problematic. Liposomes have a great advantage as far as that’s concerned and they also have a great advantage in terms of loading capacity. I'd like to think that we will have something in the clinic soon. A lot of work and research has gone into this and I think there has to be a clinical payoff soon, but it's hard to predict exactly where. Dr. Klegerman received a B.A. in chemistry from the University of Illinois at Chicago in 1968 and a Ph.D. in biochemistry from Loyola University of Chicago in 1984. For more than 30 years, he has conducted biomedical research focusing on immunochemistry, immunoassay development, and conjugation chemistry. 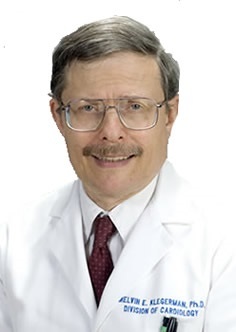 For the past 20 years, Dr. Klegerman has been involved in a collaborative effort with cardiovascular researchers under the direction of Dr. David D. McPherson to develop targeted immunoliposomes for diagnosis and treatment of cardiovascular diseases, joining the group when they moved to The University of Texas Health Science Center in Houston, where he now is an associate professor in the Division of Cardiovascular Diseases. As part of this effort, Dr. Klegerman founded two companies to develop the echogenic liposome technology into clinical products. He is an author of 69 scientific papers, awardee of four patents, and co-editor of a textbook of pharmaceutical biotechnology (1992).